The definitive book on using Microsoft Dynamics AX for food manufacturers. Columbus today announced the publishing of Food Products Manufacturing using Microsoft Dynamics AX. 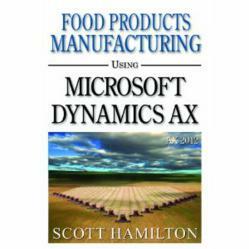 The latest book by Columbus senior consultant and author Scott Hamilton discusses the details for maximizing Microsoft Dynamics AX 2012 in food product businesses. The book focuses on how Microsoft Dynamics AX 2012 provides an integrated ERP system to support the business practices of food product manufacturing and distribution firms. According to Dr. Hamilton, the book was written for companies considering or implementing Microsoft Dynamics AX as their ERP solution. The book contents provide a complete walk through of functionality related to operations and supply chain management and numerous case studies highlight solutions to common issues. The book is ideal for firms involved in a system selection process and can help reduce selection risk, evaluate system fit and customizations and provide a vision for an integrated system. According to Columbus CEO Thomas Honore, “We work hard to develop and deliver useful content like this to make our customers and prospects more competitive - it is part of our commitment to and investment in the markets we serve.” Columbus is widely recognized as a global leader in maximizing efficiency and business performance for companies within the food manufacturing industry. “We in Microsoft Business Solutions are excited to see Scott providing thought leadership for effectively using Microsoft Dynamics AX to manage a manufacturing business and gain ROI, this time focusing on food products manufacturing“stated Kirill Tatarinov, President, Microsoft Business Solutions. With solid industry know-how, Columbus is a preferred business partner for ambitious companies within the food, retail and manufacturing sectors. Columbus’ key deliverables include flexible and future-safe ERP, CRM, BI and related business applications that deliver competitive advantage. We know how to adapt and implement our proven Microsoft-based solution sets to maximize efficiency and overall business performance – for immediate impact. Exceeding 20 years of experience and 6.000 successful business cases, Columbus currently employs over 1.000 dedicated staff working out of 41 offices in 21 countries. Read more at http://www.columbusglobal.com. Scott Hamilton consults and teaches globally on SCM and ERP issues, and has consulted with several hundred food product businesses. He authored Maximizing Your ERP System and six previous books about Microsoft Dynamics AX. Scott has won the prestigious Microsoft MVP award for Dynamics AX, and earned a doctorate in information systems specializing in manufacturing. He is currently employed by Columbus where he consults with food manufacturing clients worldwide.